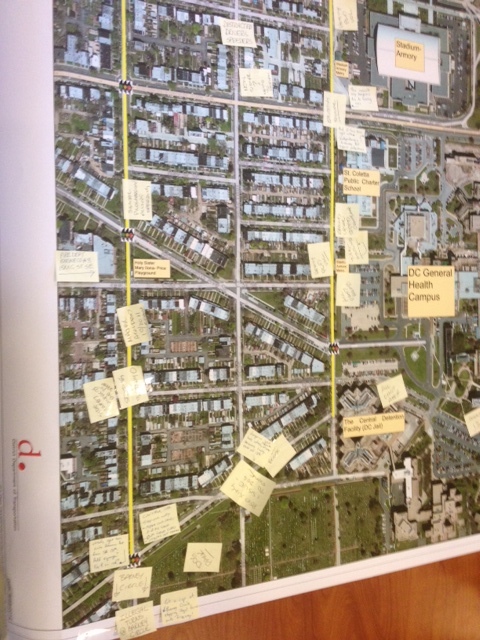 Residents used post-it notes to mark areas of concern on the 17th & 19th Street map. As I mentioned in an earlier post, last night’s meeting was meant to introduce the project, share data and get community feedback. DDOT plans to hold two public charrettes the week of July 30 to discuss potential strategies for improving safety along the corridors. One of these meetings will be held in Southeast while the other will be in Northeast. I’ll be sure to post the meeting dates and times once they are set. I encourage everyone interested in safety along 17th & 19th Streets to attend one of these two charrettes. DDOT plans to have final recommendations ready in September. Using post-it notes, residents were able to identify issues on a large map of the area, such as the high volume of truck traffic on the corridors and the need for safer pedestrian crossings near Congressional Cemetery and the Stadium-Armory Metro. The map was helpful in pointing out particular areas of concern to DDOT staff. DDOT and McKissack & McKissack shared a number of facts about 17th & 19th Street. It appears the busiest intersection along the corridor is 17th Street SE and Potomac Avenue SE, which sees an average of 10,400 vehicles per day. There was a clear recognition by DDOT that 17th Street is a morning commuter corridor. The common themes mentioned by residents during the feedback period were: speeding, pedestrian safety, truck traffic, different character of 17th Street in Southeast versus Northeast, parking and the need for prompt action to improve safety along the corridors. 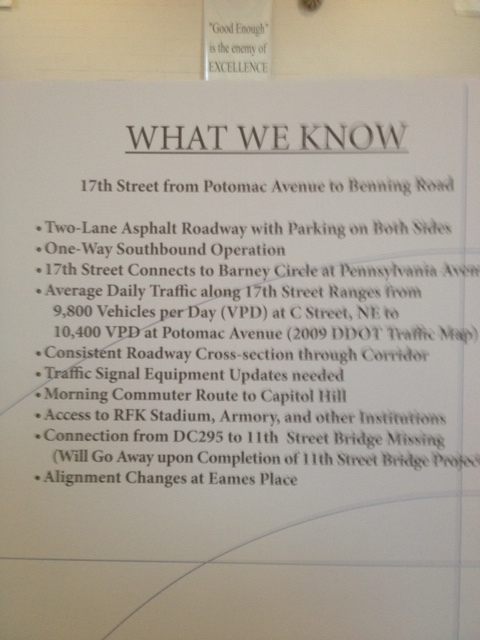 DDOT’s list of facts about 17th Street. A majority of attendees living north of C Street NE clearly did not want 17th and 19th converted to two-way streets in their neighborhood. Attendees living south of C Street NE spoke both in favor of two-way conversion and against. There was some question as to how two-way conversion would affect on-street parking. For some inexplicable reason, DDOT did not include the stretch of 17th Street SE between Potomac Avenue SE and Barney Circle in the project. I’ve asked DDOT to consider this stretch of road as part of the project, particularly due to speeding along the corridor and traffic volume from vehicles using the authorized vehicle only access to the Southeast/Southwest Freeway. DDOT representatives said they would see if this stretch could be added to the project. If not, DDOT committed to looking at traffic calming/safety options for the 700 and 800 blocks of 17th Street SE. A number of residents mentioned that adjusting the traffic signals along 17th Street SE could help reduce speed. Currently, a vehicle can travel without stopping from at least Independence Avenue SE to Barney Circle SE. There remains confusion about whether 17th & 19th are considered “minor arterials” or “evacuation routes” and what that means for traffic calming measures on the corridor. DDOT plans to clarify this question at the public charrettes. Thanks to everyone who was able to attend the meeting – a lot of great comments. And much better than the June 6 meeting. Please post anything I missed below. This entry was posted on Tuesday, June 26th, 2012 at 9:55 am and is filed under 17th Street SE, Transportation. You can follow any responses to this entry through the RSS 2.0 feed. You can leave a response, or trackback from your own site. Wasn’t the plan to have both 17th and 19th change to two way traffic soon? Has this changed? Thanks for the question Tom. Converting 17th & 19th to two-way is still on the table, though DDOT has not made a definitive decision. The goal of the public charettes is to get neighborhood feedback on these strategy and other strategies to improve vehicular and pedestrian safety along 17th & 19th.